I suppose I have been a Hammond Organ artist since age five, when I learned to play keyboard on my Father’s M-3 (we didn’t even get a piano ‘til I was 12). A few years later, Dad bartered some plumbing work for a B-3, and that was it for me. In fact, it still is, since that very organ, a late 50’s classic, still lives in my basement. 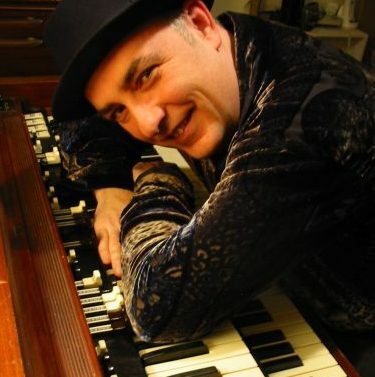 And I recorded my 2009 Hammond CD, ‘Getting’ Organized’, on that organ. I studied classical organ as a kid, attended Westminster Choir College, and got a degree in Organ Performance (I played lots of bass pedals on Bach music there). But all along, I was playing organ and piano in bands and on all types of gigs. I still put those classical chops to use in my church jobs, the latest of which is at Central Presbyterian Church in Montclair, NJ (www.centralpresbyterian.net). I started to focus more on playing jazz on Dad’s Hammond when I heard Larry Young’s ‘Unity’ album, which I’m sure is the Alpha and Omega of jazz organ works like it is for me. Also, since my Dad’s record collection was heavy on Lenny Dee, Ethel Smith, Klaus Wunderlich, etc., I had real good grounding in the 50s/60s pop styles, too. I was the Product Manager for Casio Music Instruments for many years. Along the way, I have been fortunate to play keyboards with a lot of big names, including Herbie Hancock, Chuck Berry, Bette Midler, Dion, Leonard Bernstein, Odetta, Stanley Jordan, Chubby Checker, John Lloyd Young, Rick Derringer, Al Kooper, Ronnie Spector, Uncle Floyd, Steely Dan, Phoebe Snow, Eddie Brigati, Eddie Fisher, Joe Walsh, Darlene Love, Paul Shaffer, Buster Poindexter, Levon Helm, Zubin Mehta, Bettye Lavette, Peter Hoffman, and many others. I’ve played a lot of shows on Broadway and off. And I hosted a radio show in NJ highlighting 50s/60s pop organ for a couple of years. I reached a milestone when in 2004 I became the organist at Yankee Stadium, replacing the great Hammond legend Eddie Layton. This was a dream come true for me; I remember my Dad taking me to ballgames here in New York as a kid, and hearing Layton and Jane Jarvis (the Mets’ organist in the early days), and thinking, ‘Wow, baseball… organ… I wanna do that’. Never dreamed it was possible that I’d be doing it! So, if you’re at a Yankee game on Saturdays or Sundays and have a request for my 15-minute pre-game spot, lemme know. Over the years, I’ve gravitated toward the Hammond whenever possible. and tried to master all the tonal possibilities that it has. In this regard, I learned a lot from Eddie Layton, my predecessor at Yankee Stadium, and a Hammond endorsee and star in his own right. If you are not hip to the amazing timbral bag of tricks that this man had, you owe it yourself to check his late 50s-early 60s material out. Much of this is out of print; I own and have ingested all of it. Layton could not only accurately simulate most any instrument on a B-3; he could do trains, planes, earthquakes, cats, birds, wind, heartbeats… wow. You’ll definitely have your eyes opened by what Layton could do with a Hammond, and his work at the Stadium didn’t even scratch the surface. In recent years, I did a lot of recitals for the Hammond Organ Society of New Jersey, They had an X-66 with two Leslie 910s that could take a wall of out where it resided at the Rahway (NJ Senior Center. The organization has folded, but I have custody of that instrument. Hammond is forever, the best, can never be equaled. I will always owe a huge part of my life in music to Hammond.